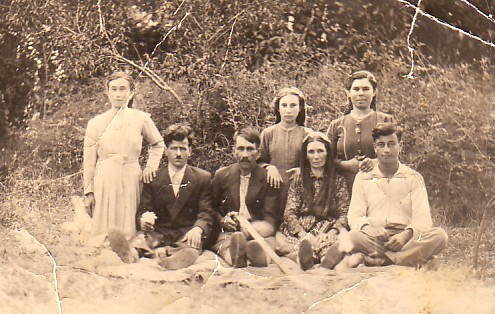 Above: The Vranis Family. 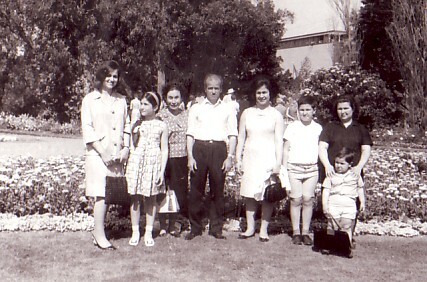 From left, they are: myself; my husband, Ignatios (Agiaparaskevotis); my father, Vasilios; my sister, Maria; my mother; Eleni (Kapetanis); my sister, Vlotina; and our neighbour, Bartholomeos. 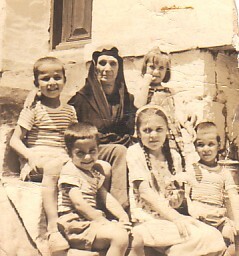 Above Right: My mother, Eleni, with some her grandchildren. 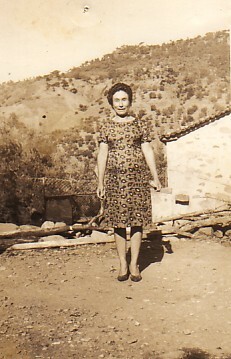 Circa 1969. Above: In the yard of our house. In the background is the view of Tou Papani (waterfall). Above Right: Botanical Gardens, Sydney, 1967 (the year we arrived in Australia). From left, we are: a family friend, Froso; my daughter, Irene; myself; my husband, Ignatios; my daughter, Eleni; Giorgos, his mother, Ekaterina, and his brother, Antonis.